Features: Two-way radio helps you to connect with your mate when the phone signal is poor. Can be attached to your belt with belt clip included. Built-in microphone. There are 16 channels for your choice. These radios need to be the same channel when you connect with you mate. Comes with a torch light,you can get bright even at dark. Comes with one pair of free headphone. Suitable for security guard, supermarket connection, construction area indication, most helpful for field survival, biking and hiking. Specification:. Walkie Talkies. UHF 400-470MHz. 4 x Baofeng x BF-888S Plus (UHF 400-470Mhz). NEW Mini Radio BF-T1. 4 x Earphone. Health & Beauty. RF Rated Power. Spurious Response. 4 x Walkie Talkies. 4 x 2800mAh Batteries. Battery Life Theory: 10000 Hour. Prevent users from receiving unauthorized signal and avoid the interference channel. Channel: 16. Provide you clear and loud sound. Want to free communication in short distance?. This two-way radio can connect each other in remote area or wild field, where shell phone signal is poor. With latest techapplied, it is very easy to use these. This radio is helpful for the following circumstances: security guard, supermarket connection, construction area indication. It is also helpful for field survival, biking and hiking. Chinese and English voice prompt: Yes. 30 x Walkie Talkie. USB Two-way Radio Walkie Talkie Free Headsets£34.99. A lightweight and compact communication device. Battery Life Theory: 10000 Hour. Frequency Range:400-470 MHz. Talk Range:1 -10 km. 5 x Walkie Talkie. USB Two-way Radio Walkie Talkie Free Headsets£34.99. Talk Range:1 -10 km. A lightweight and compact communication device. Prevent users from receiving unauthorized signal and avoid the interference channel. Baofeng BF-888S UHF 400-470MHz Handheld Two-way Radio. UHF 400-470MHz. If you don’t like it, you may apply another channel frequency. 2 x Baofeng/Pofung BF-888S (UHF 400-469.995Mhz). If you have the following issues. 8 x Walkie Talkies. USB Two-way Radio Walkie Talkie Free Headsets£34.99. Battery Life Theory: 10000 Hour. Prevent users from receiving unauthorized signal and avoid the interference channel. Protect sound from the interface of signal. 1 Walkie Talkie. Model: BF-888S Plus Improved Version. Voice Prompt, Humanism Design: Mini size, easy to operate and carry, slim fashion. Clearer Talking: With 9 class noise reduction circuit and 1000-5000M long working range, stable performance. 10 x Walkie Talkies. High-level electronic components to ensure clear voice. CTCSS and DCS encryption mode to keep the content safeguarded. Talk Range:0-5 km. Battery Life Theory: 10000 Hour. Frequency Range: 400-470 MHz. 6 x Walkie Talkies. - Frequency Range: UHF 400-470MHz. - Communication Range: City about 1-3km, Suburbs about 2-5km, Mountain about 2-5km, Plain about 4-8km. -Battery Life Theory: 10000 Hour. When and where do you need this radio ?. 3 x Walkie Talkies. - Frequency Range: UHF 400-470MHz. -Battery Life Theory: 10000 Hour. When and where do you need this radio ?. How far can this radio be connected ?. -Channel: 16. - RF Rated Power: ≤ 5W. 1 Walkie Talkie. Mini Size, Ergonomic Design: Easy to hand-hold and operate. Anti falling protection, strong and durable. OR by USB cable(not included ), charging with PC or power bank, anywhere you like. 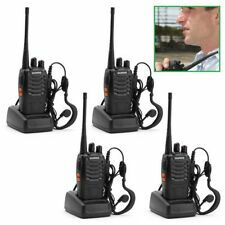 (4X Original Baofeng BF-888S 400-470MHz 2-way Radios 16CH Walkies Talkie 16H UK. 4x USB Baofeng BF-888S Two-way Radio. Unity Section 5) Voice Prompt. 8) VOX（Voice Operated Transmitting）Function. 4) FM Radio Function. These Two Way Radio Walkie Talkie are helpful for these circumstances: security guard, supermarket connection, construction area indication, most helpful for field survival, biking and hiking. Frequency Range UHF: 400-470MHz. 4 x Walkie Talkies. It features low power consumption and carries a battery with large capacity, contributing to long standby hours, very convenient! Adopting high-level components it is of low distortion to ensure clear voice transmitted in high quality. 10 Pack Baofeng bf-888s Walkie Talkie Long Range 2 Way Radio UHF400-470MHZ 16CH. Walkie Talkies. UHF 400-470MHz. Frequency Range. RF Rated Power. We do not provide pick up or local collection service so far. ￡11.99Buy It Now! ￡18.99Buy It Now! Communication Range. Baofeng BF-888S UHF 400-470MHz Handheld Two-way Radio. UHF 400-470MHz. Voice Prompt. 2x Wrist Strap. 2x Belt Clip. 2x Earphone. 2x 3.7v 1500mAh Li-ion Battery. 2x SMA-Female Antenna. Model: SRH805S. Baofeng Radio:GT-1, GT-3, UV-5R, UV5R A, UV5R E, UV5R Plus, UV-82, UV-B5. Connector Type: SMA Female. This works on many radio's and is ideal when a much smaller antenna is needed replacing a larger inconvenient antenna. Selectivity 55dB/50dB. Frequency Range UHF 400-470MHz. -1 x BAOFENGBF-888S (UHF 400-470Mhz). Communication Range about 2-4km. Spurious Response ≥60dB. You may also like. Weight (with battery/antenna) 198g. CTCSS and DCS encryption mode to keep the content safeguarded. 4 x Walkie Talkies. Battery Life Theory: 10000 Hour. High-level electronic components to ensure clear voice. Talk Range:0-5 km. Channel: 16. General Specifications Frequency Range: UHF 400-470MHz RF Rated Power: ≤ 5W Channel Capacity:16 Channel Spacing: 25KHz Operated Voltage: 3.7 V Battery: 1500MAh Li-ion Battery Life: About 8 hours Frequency Stability: ±2.5ppm Operated Temperature: -30°c- 60°c Antenna Impedance:50Ω Dimensions (L×W×H) (with battery,without antenna)：110×50×32 mm Weight (with battery/antenna)：198g Communication Range：about 2-4km Transmitter RF Power Output：3W Modulation：F3E Spurious Emission：≤65dB FM Noise：≤-45dB(W) ≤-40dB (N) Audio Distortion：≤5% Transmitting Current：≤1.3A Receiver Sensitivity (12dB SINAD)：≤0.20 uV Selectivity：55dB/50dB Intermodulation：≥65dB Adjacent Channel Selectivity：≥60dB Spurious Response：≥60dB Audio Power Output：1000mW. Frequency Range: UHF: 400- 470MHz. Widely apply to security guard, supermarket connection, construction area indication, most helpful for field survival, biking and hiking. Dual band or Single band: Single band. Walkie Talkies. UHF 400-470MHz. 2 x Baofeng/Pofung BF-888S (UHF 400-469.995Mhz). 2 x Earphone. Spurious Response. Weight (with battery/antenna). 2 x Wrist Strap. Antenna Impedance. Compatible for Baofeng BF-666s BF-888s BF-777s BF-480 walkie talkie. Suitable: for Baofeng BF-666s BF-888s BF-777s BF-480. 1 Bluetooth Adapter. Simple design, compact and lightweight, easy to carry. 1900MAh Li-ion. Walkie Talkies. UHF 400-470MHz. 5 x 3.7v 1900mAh Li-ion Battery. 5 x Baofeng x BF-888S Plus (UHF 400-470Mhz). Antenna Impedance. (with battery,without antenna). 5 x SMA-Female Antenna. 3 x Walkie Talkie. Battery Capacity:2800 mAh. Prevent users from receiving unauthorized signal and avoid the interference channel. Protect sound from the interface of signal. Talk Range:1 -10 km. Battery Life Theory: 10000 Hour. Walkie Talkies. UHF 400-470MHz. RF Rated Power. Spurious Response. Weight (with battery/antenna). Audio Power Output. RF Power Output. In event of a very unlikely slight delay, your patience would be highly appreciated. 1 Walkie Talkie. Mini Size, Ergonomic Design: Easy to hand-hold and operate. Anti falling protection, strong and durable. 16 Channel Capacity: 400-470MHz long communication Frequency range. Write frequency encryption. Walkie Talkies. NEW Mini Radio BF-T1. Health & Beauty. RF Rated Power. Spurious Response. Audio Power Output. RF Power Output. Weight (with battery/antenna). 2 x 888S radio. band or Single band: Single band Dual frequency or Single. Chinese and English voice prompt: Yes. frequency: Single frequency. Weight: 180g Dual. PC software programmable: Yes. Power saving function: Yes.